Another winter storm is on its way, and the National Weather Service in Pleasant Hill says that could mean another ten inches of snow for some of the state’s hardest hit areas. 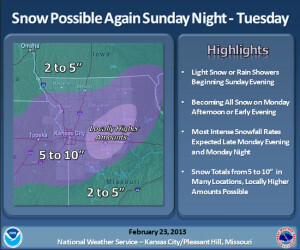 Click to go to National Weather Service Pleasant Hill website. Meteorologist Scott Blair says Monday morning commuters will want to watch closely as the storm tracks in. The storm is expected to begin sometime on Monday and not wrap up until late Tuesday, however, the forecast could change as the storm tracks in from the West. The National Weather Service is urging motorists in Western, Northwest and Central Missouri to be prepared for treacherous conditions on Monday and into Tuesday. Blair says the storm is expected to first hit Kansas City and St. Joseph and move into Kirksville, Columbia and surrounding areas. Blair says tomorrow’s temperatures into the 40s will melt off some of the snow on the ground now, but for areas that saw up to a foot of snow, several inches will remain before this storm adds another layer. Missourinet will be posting updates as the storm develops. Be sure to follow us on Twitter @Missourinet and on Facebook.